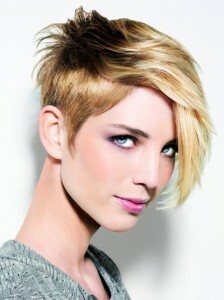 Short hair trends women love are those that are daring, bold and exciting! No more are women content to simply cut into a simple bob, now they are looking at different ways of spicing that same old bob up. With layers, razor cuts, coloring and daring to be even shorter with pixies and other styles, short hair trends women love have something for everyone. Crop cuts, while normally considered a ‘boy’s style’ are definitely becoming a short hair trend women love. Make this look decidedly feminine by having you stylist taper the neck and hair lines so that they are decidedly feminine. Unsure about having your hair quite that short, but wanting to sport something super short? The pixie crop is a short style with a couple inches of length that can be styled to look sleek and mature or totally punk-rocker chic. The quiff isn’t a style reserved for men of the Fifties any longer. Women are branching out and taking this style as their own. The quiff is alluring as it matches more feminine length with the bold look of short hair. This gives women many options; they can boost that length up in the traditional quiff look, or they can slick it down and give themselves an air of mystery hiding part of their face behind their hair. Spice up your short bob with an asymmetrical flare! You don’t even have to brave the scissors for this quick change up, simple part the bob deep to the left or the right and smooth down the hair with some product. You’ll have a new style that everyone will rave about without the cost of going in and getting an all new haircut!